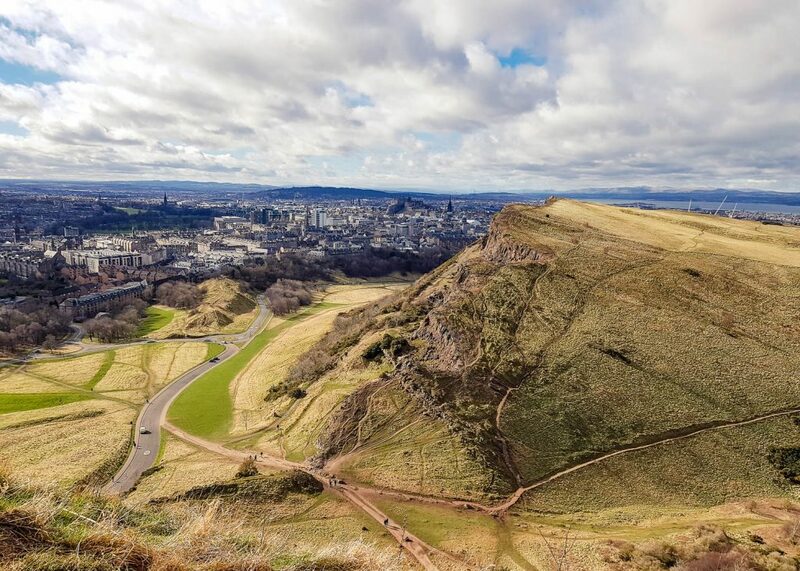 Edinburgh is famous for many things – the winding lanes of the medieval Old Town, the castle sitting high above the city, the Fringe Festival that brings crowds of artists and tourists to Edinburgh every year in August. 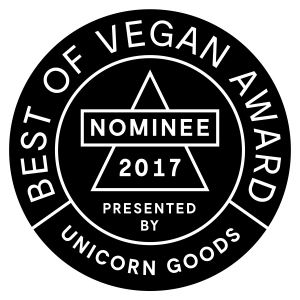 But I was in interested in another side of my hometown: I wanted to know more about the best sustainable shopping and vegan food in town. 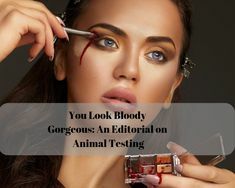 And so, I met up with local experts Ruth MacGilp and Emma Bathgate to find out. 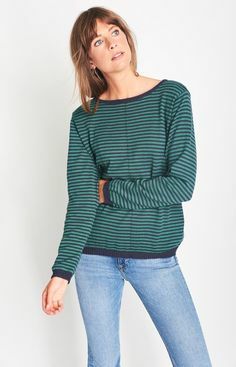 As I was waiting for Ruth to appear, the irony hit me – had I really just suggested to meet Ruth MacGilp on Princes Street, one of Edinburgh’s busiest high streets for fast fashion shopping? Ruth lives in Edinburgh and writes about sustainable fashion on her blog Urbanity. She has agreed to meet me on this windy afternoon to show me some of her favourite shops and boutiques in the city. 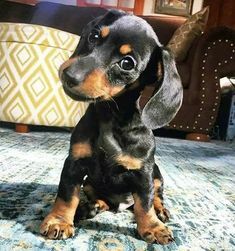 On our itinerary? Local designers, sustainable brands and a lot of carefully curated vintage and second hand – needless to say, we left Princes Street behind as fast as we could. Our first stop is an Edinburgh institution. 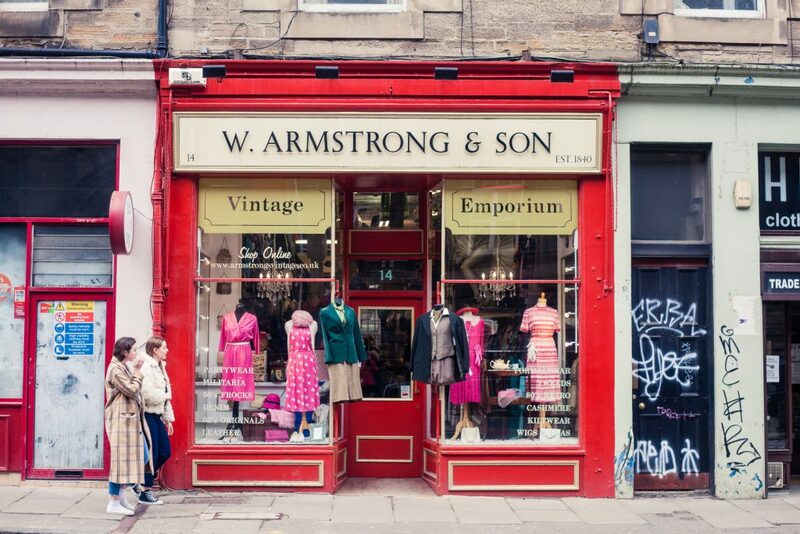 Armstrongs Vintage Clothing Emporium was established in 1840 and stocks high quality vintage and retro fashion – and a lot of it. 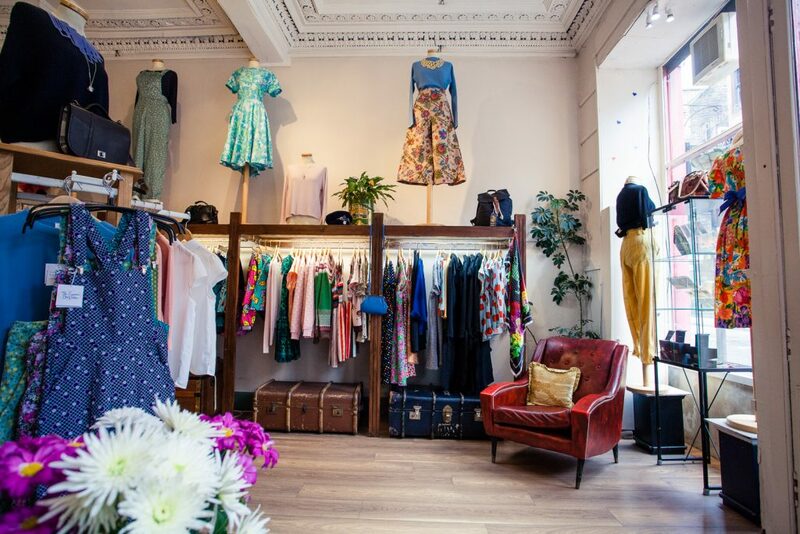 The flagship store on Grassmarket is filled with dresses, coats, knitwear and shoes from across the decades and you could spend hours getting lost deeper and deeper in the maze of rails and shelfs. The shop itself is carefully decorated with vintage items sticking out between and above the clothe rails and flying circus men made from papier mâché hanging from the ceiling. It feels like walking through a costume shop, every item of clothing an opportunity to bring the 30s, 60s or 70s back to life. Armstrongs has two more shops, although they are slightly smaller than the Grassmarket branch; one is located on Teviot Place, near the University of Edinburgh, the other one is found in the trendy Newington neighbourhood on Clerk Street. 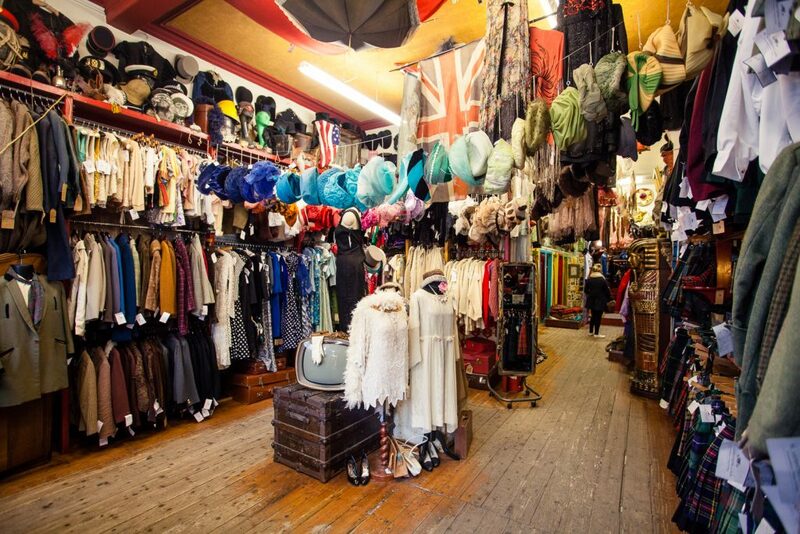 Vintage shopping is an art in itself, and if you’d like a little guide to finding good quality vintage clothing on your travels, check out this article. Next up is one of Ruth’s favourite shops: Godiva. The boutique sells a variety of labels from Scotland, the UK and further afield, and some vintage fashion too. The pieces on the rails of Godiva are all hand-selected to guarantee an independent and unconventional alternative to the shops on the high street. Fleur MacIntosh opened the shop in 2003, initially only selling second hand clothing, but soon expanded beyond that to create an innovative shopping experience. 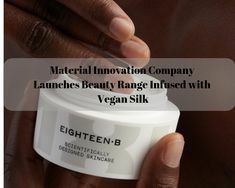 While not all of the designers featured in the shops are vegan-friendly, there are several labels that stand our from the rest. First up is German label Armedangels, which produces sustainable clothing and works exclusively with socially responsible companies. Italian jewellery brand Weave is represented with beautiful fake leather necklaces and earrings; Eka Wear uses synthetic wool and works with women in India who produce their beautiful knitted accessories in the experimental township or Auroville. Finally, my favourite label at Godiva is The Emperor’s Old Clothes from Brighton, which uses exclusively vintage fabrics & end-of-roll remnants saved from their fate of landfill. Herman Brown is a premier vintage clothing shop with a focus on quality over quantity. Owner Anna Nicholson tracks down vintage clothes, jewellery and accessories around the world in order to always stock the most unique and high quality pieces of vintage in her small boutique. 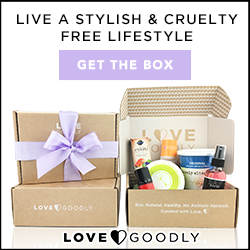 You can find iconic styles from any decade between the 30s and the 80s, but I particularly like this shop because it is a great place to pick up some timeless classics. In the shop you also find a small curated men’s selection and a collection called HB Electronics, which brings in eccentric, younger styles to mingle with the classics from older times. 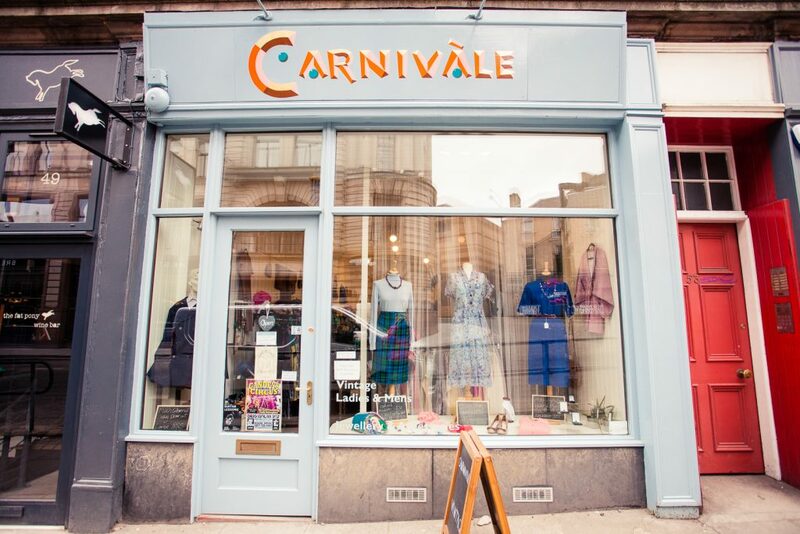 Carnivale is a fairly recent addition to Edinburgh’s vintage shopping landscape, but what a splash it makes! Everything in this small shop is hand-selected by the owner, who finds pieces from the Victorian times to the 90s, clothing, accessories and jewellery. 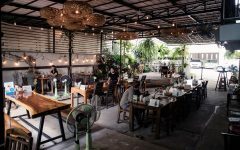 Owner Rachael Coutts escaped the world of HR and opened Carnivale in 2016. As it is with vintage fashion, every piece has a history that is worth telling; buying vintage clothing is like a journey back in time. And Rachael likes to tell these stories! 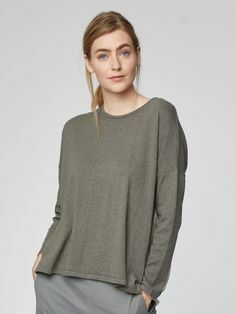 Her love for the clothing’s histories goes as far as selling sets that she picked up together only, if they are bought together as well. Now that’s passion! While there is a flourishing community of fashion and accessories designers in Edinburgh, most emerging designers decide to sell online, rather than opening their own boutiques in the city. 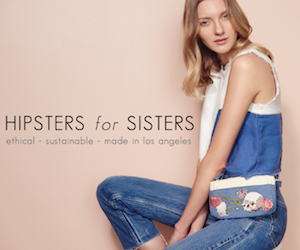 Some of Ruth’s favourite designers, who work with sustainable materials and ethical processes, are Emily Millichip, Mischke, Studio Five, Eleanor Symms and Beth Lamont. 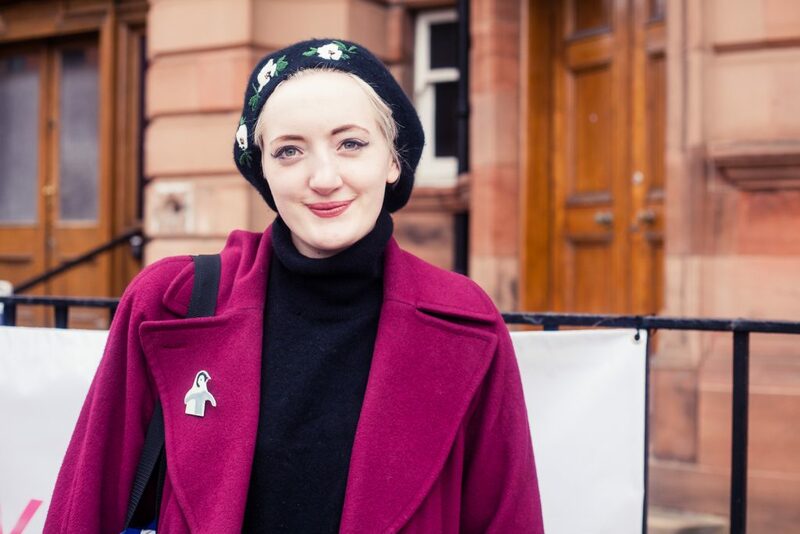 Still, there is always a lot going on in Edinburgh, so make sure you follow Ruth’s blog to stay up to date – and check out the upcoming programme for Fashion Revolution Week. 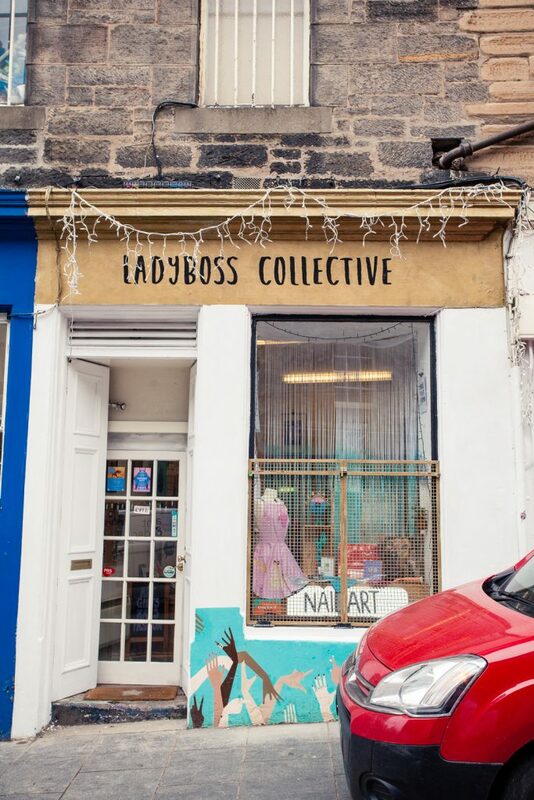 Ladyboss Collective, 23 Candlemaker Row, Edinburgh EH1 2QG – actually a nail studio, but there is a small selection of locally designed interior & decorations, as well as fashion, such as the local upcycling label Thrifty Little. Scottish Design Exchange, Ocean Terminal, Edinburgh EH6 6JJ – a social enterprise featuring fashion, artwork, jewellery and interior design by local Scottish artists. Red Door Gallery, 42 Victoria Street, Edinburgh EH1 2JW – an art gallery selling prints by emerging British and Scottish artists; they feature over 100 illustrators, as well as design products, accessories, homewares etc. Dandelion & Ginger, 29 Leven St, Edinburgh EH3 9LH – a shop focusing on fairtrade ethical, sustainable and organic fashion and gifts with products by local designers and artisans from around the world. 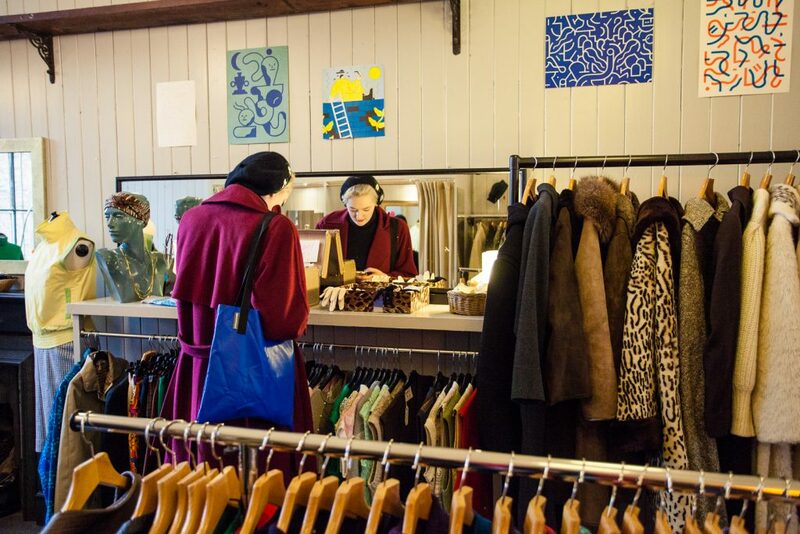 Concrete Wardrobe, 50A Broughton St, Edinburgh EH1 3SA – selling a broad range of Scottish designed crafts including jewellery, accessories, textiles, clothing, prints, glass, ceramics and homewares. Shopping always makes me hungry, so I decided to spend the rest of my trip to Edinburgh trying all the vegan food I could get my hands on. 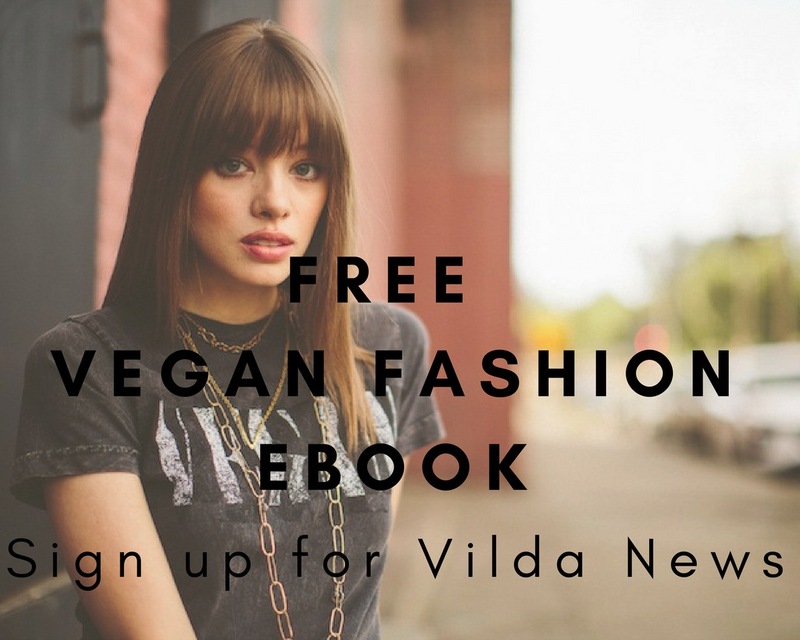 Again, I relied on the advice of a local expert; Emma Bathgate, who runs the invaluable resource Vegan Edinburgh and shared her favourite eateries with me. 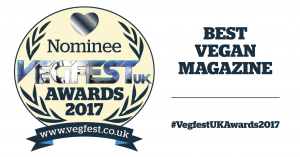 Scottish cuisine is not necessarily famous for its vegan touch, but once you’ve forgot what you heard about Angus beef or seafood from Loch Fyne, prepare yourself for a vegan bonanza. 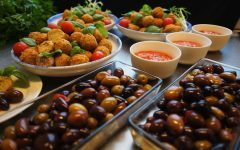 Both Glasgow and Edinburgh are home to a variety of vegan and vegan-friendly restaurants and it’s almost impossible to find a restaurant without vegan options on the menu. 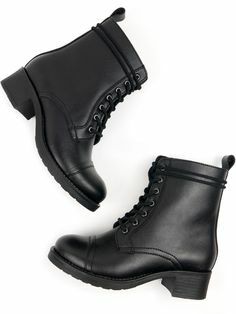 But which are the best ones? 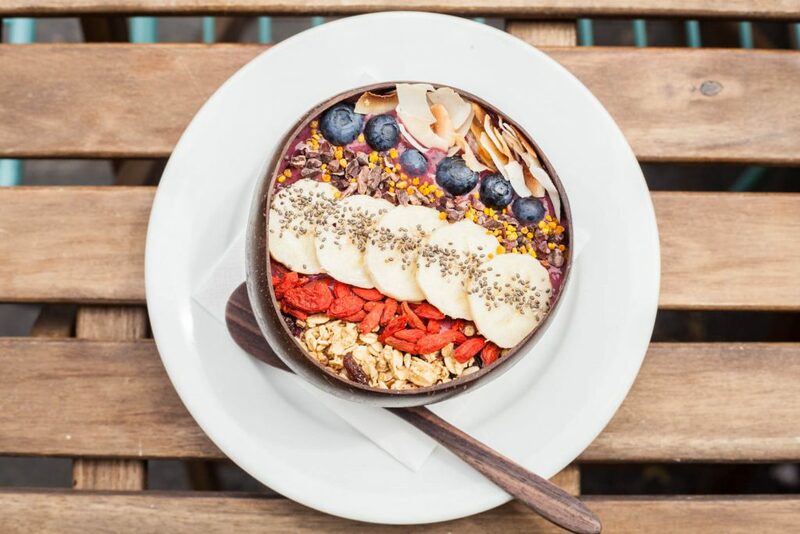 At Hula Juice Bar you can start your day with a healthy and eye-catching acai smoothie bowl, Scottish porridge, avocado sourdough toast or a hummus sandwich; its location on Grassmarket also makes it the ideal place to drop into for cake and coffee after a vintage shopping tour at Armstrongs, HB, Carnivale and Godiva. 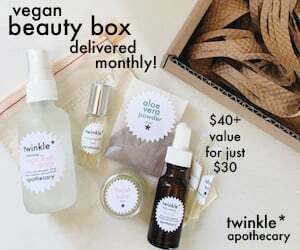 There are always some vegan options available! It was one of the first juice and smoothie bars in Edinburgh, so I would definitely recommend one of those delicacies. Holy Cow is a lovely little cafe just off Princes Street with an entirely vegan menu. This menu is seasonal, so expect it to change a lot throughout the year. 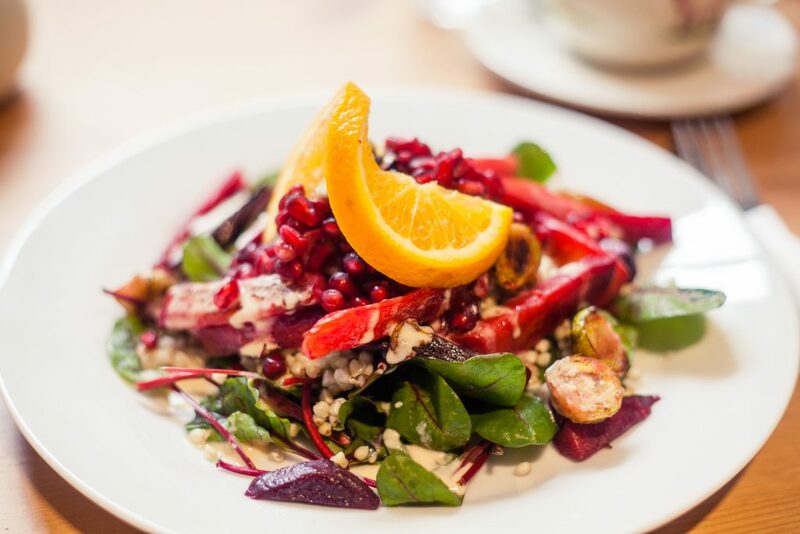 As it was a cold and windy day when I visited Edinburgh, I went for a warm winter salad with roasted winter vegetables, some crunchy greens and pomegranate seeds to spice it up a little! There are not too many seats, so I recommend coming early if you want to eat lunch here. Oh, and before I forget: leave some space for dessert! The chocolate cake I had after my salad was a whole new level of delicious. The chocolate and doughnuts from Considerit are a popular treat in my own household, so when Emma mentioned that they have an entire cafe in Edinburgh, I was all ears! Non-vegan desserts might just be a vegan’s biggest temptation, especially when your options are limited to fruit or sorbet. Not so at Considerate – this is a café, doughnut shop and gelateria all rolled into one, so no matter what your sweet tooth is craving, you’ll find it here. 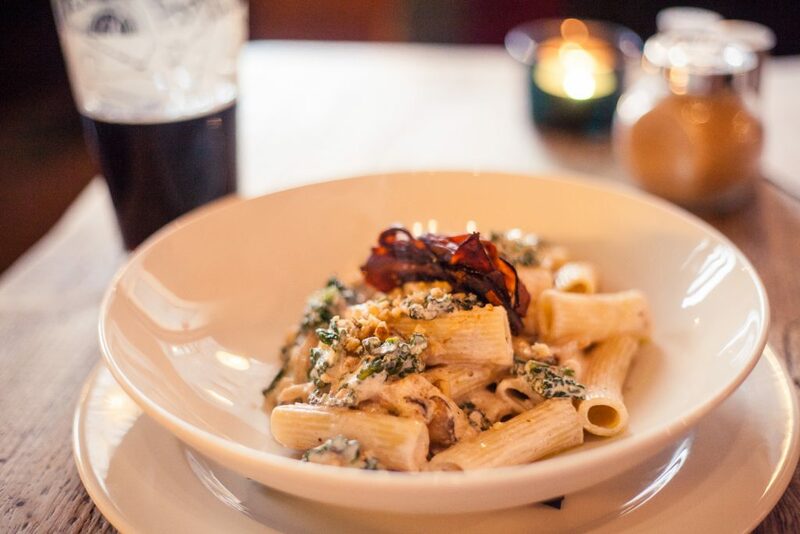 After years of satisfying the vegan Glasgow community, the team of Mono, Stereo, The 78 and The Flying Duck has expanded into Edinburgh and opened the all-vegan restaurant Harmonium. 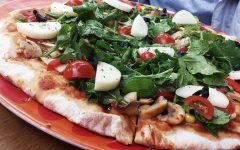 The menu consists of a mix of more traditional Scottish dishes, like Cullen Skink soup or King Oyster Scallops, and more common vegan favourites like pizzas and burgers. Harmonium is a gastro-pub, giving it a very relaxed and warm atmosphere, but the food offering is on fine-dining level. Brochan, 24 Marchmont Cres, Edinburgh EH9 1HG – a breakfast cafe focusing on porridge and granola bowls with mostly vegan ingredients (just look out for nutella, honey or bee pollen). And just like that, my shopping and eating adventures in Edinburgh have come to an end. 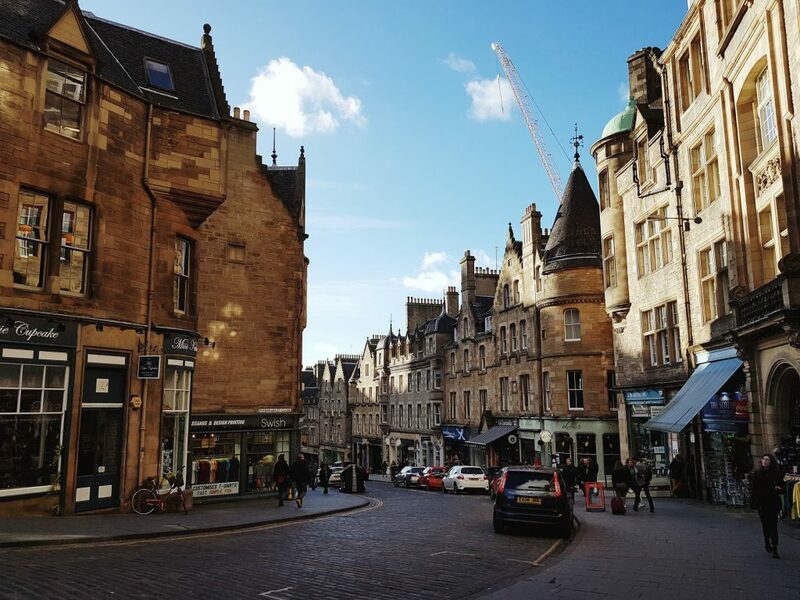 If I’ve piqued your interest to book a weekend away to Edinburgh full of ethical shopping and vegan cuisine, check out my two-day itinerary for Edinburgh.